The transition from tween to teenage years heralds a significant and often expensive personal style overhaul. During this time of rapid personality growth, how your teen styles their bedroom is just as important in expressing their newfound tastes as the clothes they wear. 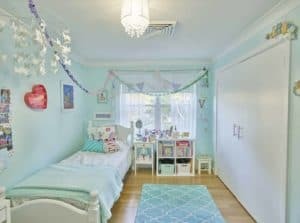 With a combination of creativity, clever ideas and White Knight’s craft and decorative paint range, White Knight DIY and Renovation Expert Cherie Barber shows that it is possible to restyle your tween’s bedroom into an ideal teen space in less than a day, and all for under $500. Kicking off the bedroom overhaul was the all-important move from a single to a double bed. 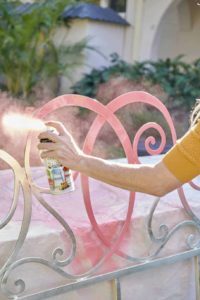 After finding an old metal bed frame at a local garage sale, Cherie used White Knight’s multi-benefit spray paint Squirts in Gloss Fuschia to inject some colour. As a two-in-one primer and paint, Squirts is easy to apply and bonds well to a multitude of surfaces including metal, wood, plastics and ceramics making it an ideal for both interior and exterior use. With over 40 colours available, the quick-drying formula is touch dry in 10 minutes, meaning Cherie was able to move on to her next project in no time at all. To add excitement to the room and bring in the tropical theme to the top of Ava’s existing study desk, Cherie used White Knight Squirts in Lemon Yellow. When applying, Cherie suggests holding the can about 20 cm from the desktop surface and using a sweeping motion to ensure an even finish from several light coats. This way, you’ll achieve a beautiful, bright desk that makes studying so much more fun! Using White Knight Squirts again, Cherie recoated Ava’s current chair to give it a new lease of life. Bringing in the tropical yellow tone, Cherie easily converted what was a once a tired looking piece of furniture, to a refreshed one which makes a cool addition to Ava’s relaxation area. To help with the busy schooling and social lives that teenagers lead, they need somewhere to scribble notes. White Knight’s Chalkboard paint provides a hard-wearing finish that transforms surfaces into a fun and functional chalkboard. 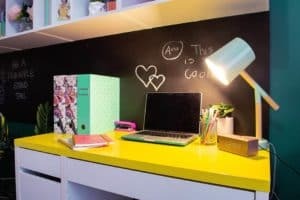 To do this, Cherie picked up a piece of melamine from a local hardware store and painted it with a coat of White Knight’s Chalkboard paint in Black, creating the ideal message board and perfect solution for this teen room. By using the pieces that are already owned, Cherie managed to stick to the budget yet create a completely new space fit for any teenager. With the help of White Knight’s Craft and Decorative range, Cherie has upcycled many of Ava’s tween fixtures and brought life to inexpensive furniture. With the addition of a range of tropical themed décor such as bedsheets, wall pictures and the all-important pineapple cushion, Cherie’s stylish and affordable bedroom upgrade is complete for under $500. White Knight paints are available from Taubmans Professional Trade Centres and Bunnings nationally. For more White Knight DIY projects and products. 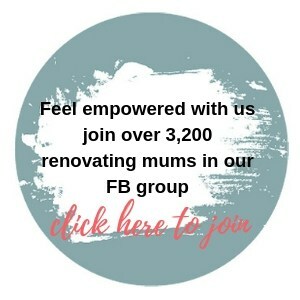 Don’t forget to join the Renovating Mums Facebook group to chat with other like-minded mums and share your makeover tips!